London's Duck and Waffle offers precise, well-crafted cocktails along with a magnificent view of the city. St. John Bread and Wine serves traditional British fare. Editor’s note: While Register food columnist Betty Teller has been off dining throughout South America, local author Olga Mosina has contributed a column for us at home. The longer one lives in a wine and food destination like Napa, the harder it gets to be impressed with a choicey tasting menu or an extensive wine list. On a recent trip to London, we were delighted to discover several excellent places that reminded us of Napa but did not make us feel homesick. In addition to distinctive food and drinks, these five spots offer pleasures that feel uniquely British — whether it is big-city glitz, an interesting angle, or the confidence that comes from being open for business for 10 consecutive centuries. If you, like us, have followed cocktail master Andrew Salazar from Fagiani’s to Miminashi in Napa, you will be impressed by the bar creations of award-winning British mixologist Rich Woods at Duck and Waffle. There, our culinary journey started on a high note, quite literally, as the scenic glass elevator whisked us up and away from busy streets of the City, a somewhat intimidating hostess, and all of the day’s travails. Up on the 40th floor, we found ourselves in a stylish bar with graffiti-adorned wall, weathered-wood ceiling, vintage-looking tile floors, and an open, “inside-out” bar in the center of the room. The magnificent views of the night city through the two floor-to-ceiling glass walls were undoubtedly the most lavish adornments. With such views, Duck and Waffle could easily get away with a mediocre fare. We were glad it did not. We were treated to precise, well-crafted cocktails with seasonal ingredients such as pine needles, charred chestnut, caraway and mince pies. Bar food (we tried crispy spiced pig ears, smoked eel croquettes, and an oven-fresh round loaf of rosemary and garlic bread) was equally flawless. Cocktails at Duck and Waffle at £14 ($18.3) do not come cheap but considering the view and the taste that lingered well beyond our ride down, they seemed like a good value to us. Out of a few wine bars we visited in London, The 10 Cases was the one we wanted to return to. Smaller and more spartan in decor than our Napa favorites Cadet and Compline, The 10 Cases shares their studious but unpretentious approach to wine and adds an adventurous business concept, which only a global city like London can support. The place is named The 10 Cases for one simple reason: They only buy 10 cases of each wine and when they run out, they bring in a new wine. No wine has allegedly been listed twice since opening in 2011. Two dozen wines on the list included intriguing options from Portugal, France, Greece, and Slovakia (£4-10 a glass). We appreciated the concept, which encouraged us to come back to explore new wines, and enjoyed delicious small plates (even the ubiquitous cheese plate was scrumptious!) and the snug bar, which stimulated conversations with jolly neighbors. The 10 Cases also has a wine bar and shop next door, where the monthly changing by-the-glass offering is complemented with 300 wines by the bottle, which can be taken away or drunk on premise with a corkage fee. The place filled up quickly in the evening with a mix of couples, nearby office workers, and tourists theater-goers like us. Despite the uber-central location near Covent Garden and West End theaters, the The 10 Cases felt like a neighborhood café where everyone was welcome. If you enjoy La Taberna and Zuzu in Napa for their good wine list, lively atmosphere, and simple but thought-out seasonal menu, Brat will offer all of that, elevated to the Michelin star level. Whole turbot, or brat in colloquial old English, is the restaurant’s specialty, grilled in a basket over charcoal. The restaurant focuses on open-fire cooking the Basque way with British ingredients, so most items on the menu are grilled, smoked, or roasted. The turbot was sold out by the time we arrived on Sunday afternoon, so we went with another fish, John Dory, and a few small plates. The food presentation followed the menu’s simplicity—just what seemed to be a handful ingredients and not a single superfluous adornment. (I have since seen a few of Parry’s recipes, and they contained far more ingredients than I could have imagined). Everything we tasted was precise, focused, sort of scaled down to a few perfect notes. It was also full of flavor. The wine list, while much longer and wordier than the food menu, offered the same classy simplicity: only Old World wines, and a heavy emphasis on classic wine-producing countries, France and Spain. Classy and simple is a good way to describe the interior, as well: lived-in dark wood paneling, inherited from the space’s previous life, large windows that fill the room with light, small wooden tables placed tightly next to each other, and a brick and stainless steel oven that is the focal point of the modestly-sized dining room. Brat’s simplicity and precision certainly require a lot of thought, schooling, and self-confidence of the team working there. For us, it was just an effortlessly enjoyable evening. For all the readers who are still reeling at the loss of Cindy’s Backstreet Kitchen and the way chef Cindy Pawlcyn elevated a simple meatloaf from a humble weekday dinner staple to a destination dish, this London meal cannot be missed. London’s Fergus Henderson caused a sensation in 1990s by taking everyone back to humbler times and showing that all parts of animal are worthy gastronomic exploration. Together with a partner, he opened St. John Smithfield restaurant in 1994 and published the first “Nose to Tail Eating” cookbook a few years later, which has since become a foodie classic. In 2009, the restaurant got a Michelin star, which it has retained ever since. We ate at the offspring of that original restaurant, called, a dining room, bakery and wine shop that ditched the white table cloths but retained the white-walled minimalism and a relaxed food experience. There are no frills, embellishments, or complicated ingredients at St. John. The place is all about seasonal British food, its pure taste and flavor. We had roast bone marrow and smoked cod’s roe, dishes that seem to stay on the menu while many others change daily. 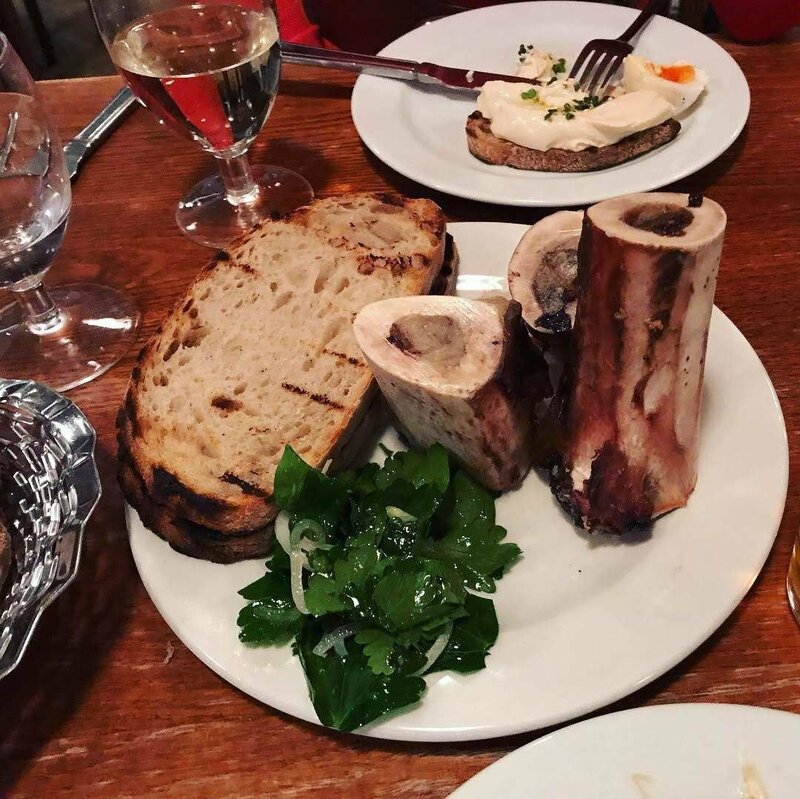 The roast bone marrow served with hearty slices of house-baked toasted bread and a spoonful of parsley salad made my husband delirious. His heavenly dream since then has been to go to St. John after work, have the roast bone marrow toast with a pint of good ale and leave happy about himself and the world. St. John Bread and Wine is not just about animal parts. Vegetarians will delight in seasonal legumes, which in January included squash, white cabbage, sunchoke, potatoes, chard, and fennel. True to the name, bread and wines were completely deserving attention as well. The all-French wine list offered a lot of interesting choices, including from St. John’s own winery in the Languedoc. My only regret is that we had no room for St. John’s renowned eccles cake and freshly baked madeleines. For that, we have to go back. Borough Market on the south bank of the Thames is like the Oxbow and the farmers’ market combined, only five times bigger, over 900 years older, and 100 times more charmingly chaotic. To have survived and flourished for most of its 1,000 years of existence, the market must thank its position near the London Bridge, which for many centuries was the only connection between the south bank (what used to be the town of Southwark) and the City of London. In medieval times, it was a place to sell corn, cattle and produce, and in the 19th to mid-20th century, it was a wholesale fruit and vegetable hub of national importance. The rapid growth of supermarkets in 1970s and challenging local economy brought a near end to the market. It was a renewed interest in artisanal, sustainable, locally-produced food, coupled with economic recovery and local initiative that gave the market a new life in the 1990s. “Borough Market is what other artisanal market wannabes want to become,” said my husband. Indeed, it has history, energy, and international fame. It blends together the centuries-old marketplace vibe, modern-day Britain’s ethnic diversity and connections with the rest of the world. With over 130 British and international vendors, food choices seemed boundless: from fresh meat, fish, fruits and vegetables to cheeses, pastries, spices, preserves, wine and beer. That’s not counting hot food, prepared right in the stalls, which ranged from British roast hog to Thai coconut puddings. Tempting displays of beautiful produce, the smells and sounds of cooking food, and crowds of people filling narrow passages overwhelmed us. We had to walk around the market at least twice before making any choice. The architectural mashup of Art Deco gates, Victorian glass and ironwork roof, brick archways of railway tracks that run above the market, and the majestic backdrop of the Gothic Southwark Cathedral next door, added to the bright and colorful market chaos. After a rather traditional start with British sausages, French pastries and fair trade coffee, we took a museum break. Back for round two, we tried Caribbean curried goat and Ethiopian stir fried stew. There was hardly any place to sit, so we consumed the street food on the go, as we should, joining happily munching crowds. With over a dozen cafes that surround the market and are part of it, there are many options to eat a bit more comfortably. That’s where we finished our culinary journey, raising a pint of British ale to the city we love and to good food that connects people. Duck and Waffle, 110 Bishopsgate, open 24/7. Brunch and dinner reservations to the restaurant are highly recommended, the bar area operates on the first-come, first-serve basis. We were lucky to be quickly seated in the bar on a weekday night but understand there may be a long wait. The 10 Cases, 16 Endell St., Covent Garden, open Monday—Saturday from 12pm to 11pm. The bistro part only has 10 tables inside, so dinner reservations, especially for Friday and Saturday, are highly recommended. The wine bar/shop accepts reservations for lunch only, otherwise operates on the walk-in basis. Brat, 4 Redchurch St, Shoreditch, open Monday—Saturday for lunch and dinner and Sunday from 12 p.m. to 5 p.m. Reservations for weekends and dinners are highly recommended. Bar operates on the walk-in basis. Olga Mosina is a Napa-based freelance travel writer who derives immense pleasure from cultural, gastronomic, and vinous delights around the world.